Standard Chartered's forecast sees Egypt overtaking Russia, Germany and Japan to be the 7th biggest economy globally. 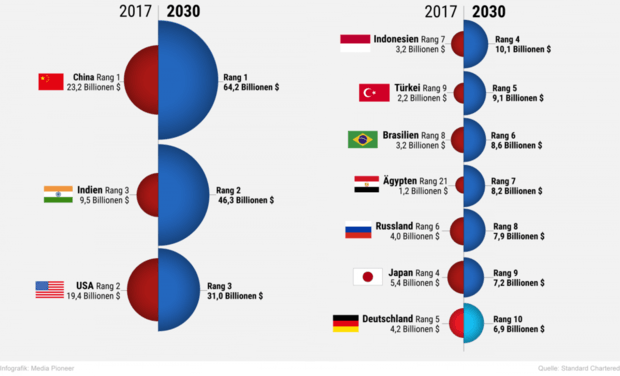 2030 might be the year Egypt becomes among the big players in world economy, ranking at the 7th place globally. Standard Chartered named the top 10 economies by 2030, 7 of which are currently classified as emerging. The ranking is based on nominal GDP using purchasing power parity exchange rates. Egypt came ahead some of the current world largest economies like Germany, Japan and Russia. China came at first place followed by India, USA, Indonesia, Turkey, Brazil then Egypt; the only Arab country to make it to the top 10. While Germany came last. Standard Chartered expects Asia's share of global GDP to be equal to USA and Europe combined which equals about 35%. Purchasing power parity or PPP is a theory comparing countries by an approach called "basket of goods" which places 2 currencies at equilibrium when a basket of goods costs the same in both countries.